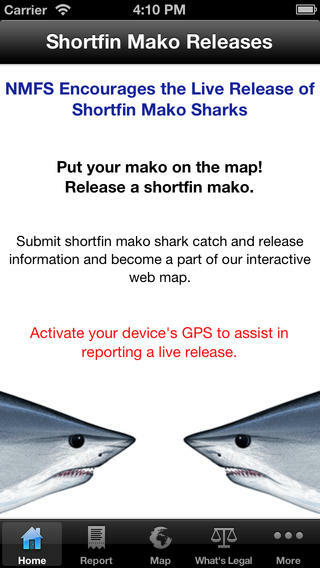 The NOAA Release Mako App was created for fisherman to report their releases of Shortfin Mako sharks while on the water. In order to offer the tool on another platform, the National Marine Fisheries Service released an iOS version of the app earlier this year. The submission form is easy to fill out and operates like the online submission form. Touching the latitude and longitude boxes provides an location when GPS is available. The app also includes information about shortfin mako stock status, fishing regulations, FAQs, and safe handling and release guidelines. Check out how NOAA conceptualized this app. You can find more government mobile products like the Release Mako App on the USA.gov Apps Gallery.